Presenting our ABS-Lock V-B anchorage point in moving images: Watch our short product video to find out more about its most important features! This easy-to-install stainless steel anchorage point is simply embedded in a concrete surface using a special drive-in dowel (M10). Thanks to its discreet anchorage eyelet, this device, which can be used to secure 1 individual, is virtually indiscernable to the eye following installation. Our ABS-Lock V-B anchorage device is designed for 1 individual. 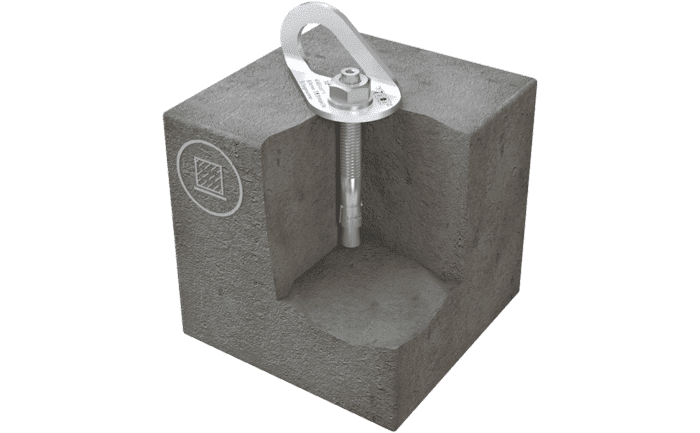 This fall arrest device, which is equipped with a discreet anchor tab, is unobtrusive to the eye and does not spoil the architectural design of your building. Our compact anchor weighs less than 40g. It is equpped with a drive-in dowel (M10) - making it extremely easy to install in concrete. Simply hammer the dowel into a 80 mm bore hole and tighten up the nut. This anchorage device is tested to withstand axial and lateral loads. Our ABS-Lock V-B is also easy to install in a ceiling. A countered model is also available for steel structures.